In black and white or color! documents electronically. Print in full color, and more. Now business color is for everyone. Print, copy, scan to file. scan to email... all in color. Create presentations, proposals, and reports certain to be noticed with color. 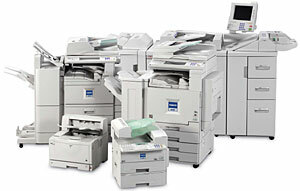 Duplex, collate and staple with exceptional speed... right from your desktop. You'll be glad to say, "SAVIN works here!"